Monday, February 4, 2019, 7 - 9pm at the Kenmore Public Library, 6531 NE 181st St, Kenmore 98028. How does our current voting system impact voting and elections? Are there solutions and methods to create more representative democracy? 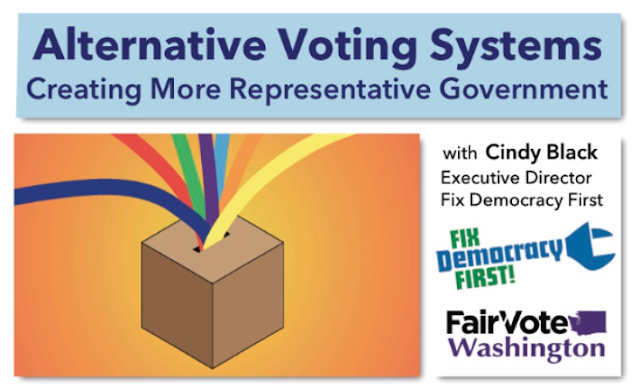 This presentation will explore our current voting system and how adopting alternative voting systems like ranked choice voting and proportional representation could lead to fairer elections and better representation. Hosted by Cindy Black, Fix Democracy First Executive Director. Fix Democracy First is a nonpartisan non-profit organization in Washington State fighting to improve our Democratic processes, and has been supporting public financing of campaigns, fair elections, overturning Citizen’s United, alternative voting systems, protecting voting rights, and other similar pro-democracy efforts for almost two decades. Cindy Black is the Executive Director of Washington State’s Fix Democracy First, and committed to helping pass pro-democracy reforms and building an active citizen's movement here in Washington State, through ongoing coalition building, common sense legislation, and civic outreach. Cindy was also the Campaign Director for WAmend’s successful Initiative 735 statewide ballot campaign, making Washington the 18th State to call for a U.S. Constitutional amendment to overturn court decisions like Citizens United. She is also the host of Democracy Speaks, a local community radio/podcast program, focusing on important local, state, and national democracy issues, as well as solutions to create fairer and better representation for all.